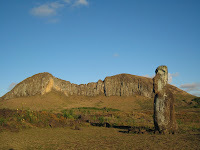 Rapa Nui is one of the most isolated inhabited places in the world. The closest inhabited island is Pitcairn, almost 200 km away. 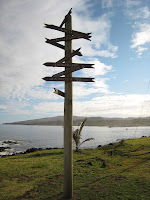 It is 4100 km to Tahiti and 3700 km to the Chilean coast. 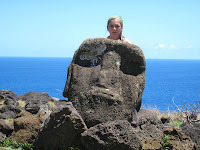 Rapa Nui belongs to Polynesia, a geographic area defined by an imaginary triangle : New Zealand, Hawaii and Rapa Nui. The island is of volcanic origin and constitutes the peak of a submarine mountain range. It rises around 3 thousand meters from the sea floor! Its base is in the form of a triangle and covers an area 50 times as large as the area above the surface of the water. 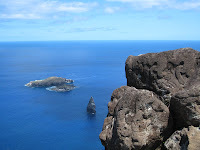 In each corner, as a result of volcanic eruptions, there is a major volcano, Poike in the north-east (3 million years old), Rano Kau in the south (2 million years old), and Terevaka in the north-west (200.000 years old). There are also 104 eruptive centers in the form of craters, cones and domes. 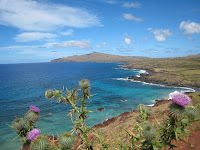 Current Rapa Nui's flora and fauna dramatically illustrate the ecological degradation process that has been affecting the island since the beginning of the human occupation, around 12 centuries ago. It was covered by around 14 tree species and a wide variety of bushes, among which the endemic palm Paschalococos disperta, that densely covered some sectors. This and other species were gradually devastated until their complete or almost complete disappearance. The island is now covered by prairies made up of some native species, but predominently introduced species, including some very aggressive species. 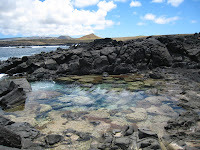 Before the arrival of humans, Rapa Nui was one of the main reproduction centers for marine birds in Polynesia, with up to 25 or 30 nesting species. Most of them disappeared due to the hunting of eggs and habitat damage. Land species disappeared as a result of human colonization and the introduction of the Polynesian rat that feeds on birds eggs. In recent years, only five species of birds have been confirmed as nesting in Easter Island, with 4 of them being threatened. It is possible to observe Makohe or Frigate birds, Kena or Boobies and Tavake or Red Tailed Tropic Birds. Marine fauna is more varied with about 130 species of fish, 25% of wich are endemic. 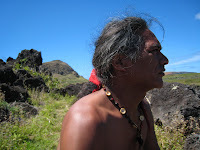 According to oral tradition, the island was colonized by a group of villagers from a Polynesian island, lead by Hotu Matu'a, an ancestor of the Rapanui people, probably around the 8th or 13th century. Within a couple of centuries, the population multiplied and developed a culture surprisingly complex, highly stratified, and organized into 10 mata or main groups, that occupied the island in the form of a territorial organization typical in Polynesia. The coastal shore was reserved for the ceremonial centers and high ranking groups. The ariki (king) wielded absolute god-like power. Common families lived in the interior of the island, and there they constructed houses, planted crops and bred animals. 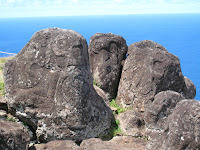 For centuries, the people worshipped ancestors, building ahu (altars) and carving moai. Survival in an environment of limited surface (the three sides of the island triangle measure around 16, 17 and 24 km) and lack of marine resources was a challenge, and the population had to adapt to increasingly difficult conditions. The destruction of the ecosystem was parallel to the growth and devlopment of the ancient culture. Oral tradition and archaeological evidence speak of intense crisis and internal wars that marked the latter periods of the island's history. The centuries before contact with the western societies were characterized by the overuse of resources, abandonment of moai carving and ahu construction, and the invention of a new cult : the cult of tangata manu, the birdman. The Tangata manu was the winner of an annual competition to collect the first Sooty Tern (manu tara) egg of the season from the islet of Motu Nui, swim back to Rapa Nui and climb the sea cliff of Rano Kau to the clifftop village of Orongo. Contestants were revealed in dreams by ivi-attuas (individuals with the gift of prophecy). The contestants would each appoint a Hopu who would swim to Motu Nui and fetch them the Egg; whilst the contestants waited at Orongo. The race was very dangerous and many Hopu were killed by sharks, drowning or by falling. The winner was given a new name and the title Tangata manu, and great power on the island. His clan had sole rights to collect that season's harvest of wild bird eggs and fledglings from Motu Nui. Make-make was the chief god of the birdman cult, the other three Gods associated with it being Hawa-tuu-take-take (the Chief of the eggs) his wife Vie Hoa and Vie Kanatea. The Birdman cult was suppressed by Christian missionaries in the 1860s. Motu Nui. 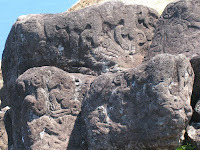 Petroglyphs on rocks at Orongo. Make-make and birdmen. 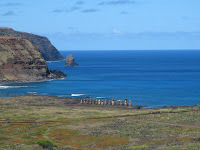 The first contact with Europeans (the Dutch explorer Jacob Roggeveen) occured on Easter Sunday 1722, an event that led the most well-known name for the island today, Easter Island. 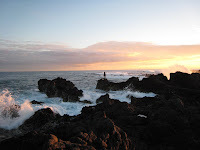 Internal warfare and, the dramatic impact of Peruvian slave raids, and the introduction of unknown diseases to the population almost completely exterminated the Rapanui people in the second half of the 19th century. 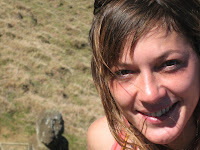 Today, 2.200 Rapanui and 2000 Chileans live on the island. 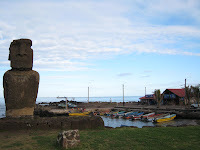 The island belongs to Chile, but discussions are held to obtain independence and be ruled by a Polynesian government. pehe koe : how are you? riva riva : fine, good !